Toshiba didn't want to be left out of the refresh round up and they've published their press release with all the updates which they are bringing to their laptops and All-In-Ones! The most interesting update is to the high-end Satellite P series; these devices will receive a lovely new touchscreen for the 14-inch model and if you go for the 17.3" beast then you can have a 1080p display too! Toshiba also revamped the LX815 and LX835 all-in-ones and all of the Satellite C, L and S series laptops, but they weren't specific on any of the changes which will be happening here, but hopefully we'll hear something more specific soon! We expect the products to ship in February because there's nothing dramatically new here! We did however get news about their Qosmio X875 laptop. This is a 17.3" monster and you can pick one up in February with hybrid storage options. So you can have a 1TB hard disk, as well as 8GB of on-board NAND flash memory which Toshiba wants to use as a cache and the theory is that this will reduce applictaion loading times. 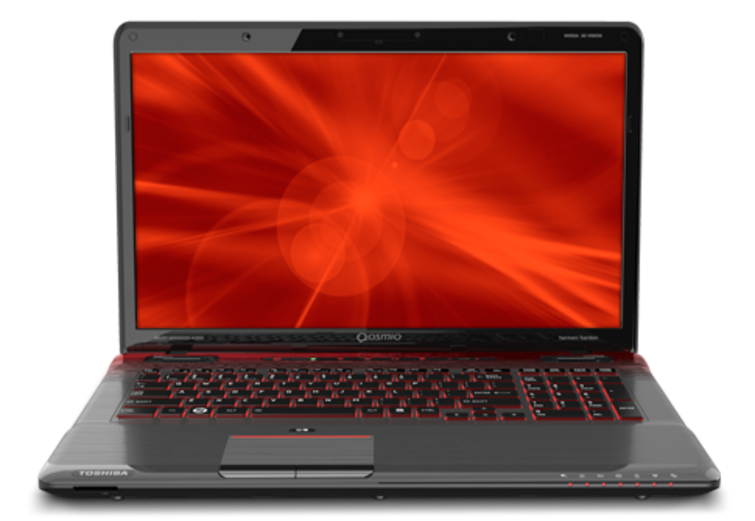 Other than that the Qosmio remains unchanged; you can have the Intel Core i7, up to 32GB of RAM and that 1080p 17.3" display. Aside from that you can have Nvidia’s GeForce GTC 630M, and if you so desire you can go for a stereoscopic 3D option. The version of this laptop with hybrid storage will be available in the United States from February, priced at around $1625 or £1,000, there's no word on when this is coming to the UK. (Via PCPro). The full press release is embedded below! LAS VEGAS, CES 2013, LVCC Central Hall Booth #10926 – Jan. 7, 2013 – Toshiba's Digital Products Division (DPD), a division of Toshiba America Information Systems, Inc., today announced updates to its mainstream PC line-up for early 2013, including new Satellite® laptops as well as All-in-One PCs that are scheduled to begin shipping in February. "Whether consumers are looking for all-around PCs to handle basic tasks, multimedia powerhouses to enjoy the latest games and movies, or innovative new PCs that take advantage of touch screens, our new line has something for everyone," said Carl Pinto, vice president of marketing, Toshiba America Information Systems, Inc., Digital Products Division. "We've ensured our PCs are optimized for Windows 8 with stylish designs with great performance and Toshiba innovations that enhance the computing experience." • Satellite P-Series: Powerful, portable and equipped to entertain, the Satellite P-Series are the perfect laptops for media enthusiasts and power users. Featuring 3rd generation Intel® Core™ processors, and fast 1600MHz DDR3 memory, LED-backlit keyboards and available discrete graphics make them ideal for multitasking and multimedia. The Satellite P-Series is available in 14-, 15.6- and 17.3-inch diagonal screen sizes with a new Full HD 1920 x 1080 resolution option on the 17.3-inch model and a touchscreen for the 14-inch model. When it comes to entertainment, the laptops include with premium Harman Kardon® speakers enhanced with SRS® Premium Sound 3D™ and Slipstream™ port technology that reduces distortion and creates a more precise, rich sound. The Satellite P-Series are also equipped to take advantage of Windows 8 with spacious, buttonless touchpads ideal for Windows 8 gestures. • Satellite S-Series: For all-purpose entertainment and productivity, the Satellite S-Series offers smart performance and design for superior multitasking, HD entertainment and creativity. Equipped with 3rd generation Intel Core processors, optional AMD Radeon graphics, custom-tuned chambered speakers with SRS Premium Sound HD™ audio, the Satellite S-Series delivers premium performance and sleek aluminum design at affordable prices. The Satellite S-Series is available in 15.6- and 17.3-inch diagonal screen sizes. • Satellite L-Series: For those looking for a versatile PC offering great style and performance, the Satellite L-Series is a great choice. Designed with Toshiba's Fusion™ finish and equipped with the latest Intel or AMD processors, HDMI® and dual USB 3.0 ports , the Satellite L-Series also includes chambered speakers with SRS Premium HD audio, great for listening to music or watching movies. The Satellite L-Series is available in 15.6- and 17.3-inch diagonal screen sizes. • Satellite C-Series: Ideal for the budget-minded consumer looking for a great value, the Satellite C-Series offers all the essentials to tackle everyday tasks. Now available with Toshiba's stylish Fusion finish, a large touch pad with gesture support, plus optional HDMI and USB 3.0 ports, the laptops are a great choice for those looking for the essentials to tackle basic tasks at an affordable price. The Satellite C-Series is available in 15.6- and 17.3-inch diagonal screen sizes. • All-in-One PCs: Toshiba's 21.5-inch LX815 and 23-inch touch screen LX835 All-in-One Desktop PCs deliver high performance for effective multitasking and HD entertainment, style and affordable pricing. These uniquely designed All-in-Ones are fully equipped with 3rd generation Intel Core processors, can be configured with up to 16GB of memory and up to 3TB of storage . The PCs offer two USB 3.0 ports plus four USB 2.0 ports and superior audio from Onkyo® speakers with SRS Premium Sound 3D. 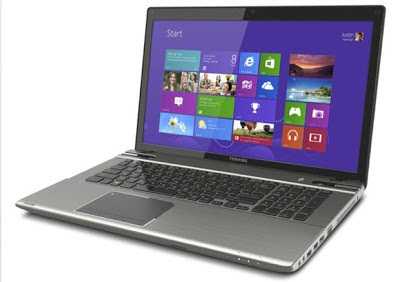 The new Satellite laptops as well as the All-in-One PCs are scheduled to begin shipping in February 2013.